The number of people facing severe hunger in the world has continued to rise. living in remote areas to rapidly resume local food production and earn an income. 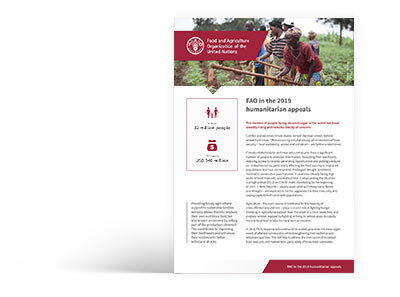 In 2019, FAO’s response will continue to be scaled up to meet the most urgent needs of affected communities while strengthening their resilience and adaptive capacities. This will help to address the root causes of increased food insecurity and malnutrition, particularly of those most exposed and vulnerable to shocks. FAO is appealing for USD 940 million to assist 32 million people. FAO can help vulnerable families better withstand current and future crises and regain their self-sufficiency, livelihoods and lives.